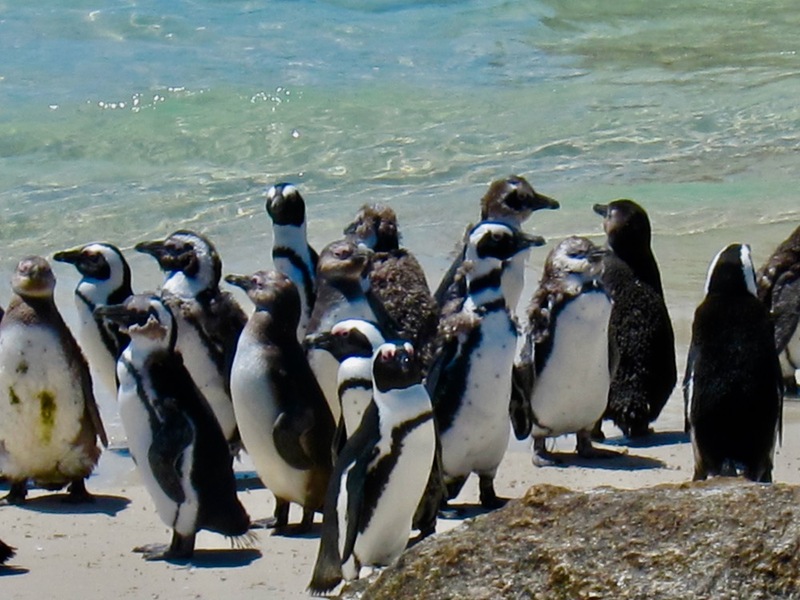 The Penguins were the centerfold magnet for a visit to Boulder's Beach and one of those they attracted way before we went to South Africa was my husband. He had been in South Africa before but then it was the social issue of the ending of apartheid that took every moment. This time, we went there as tourists and, of course, we just couldn't resist tap dancing to Boulder's Beach and the famous penguins. Unhappily, our chosen visit day was a national holiday so most of Cape Town had the same idea as the beaches close by are fantastic. As usual we just lucked out after Grumpy who was driving the rental through traffic and clicking just about every car's mirror as we squeezed through was not stopped for any of the accidents, incidents and "birds" that he caused. ​These penguins are oblivious to tourists who I think are seen as a necessary nuisance, a food source and a humorous addition to the landscape. 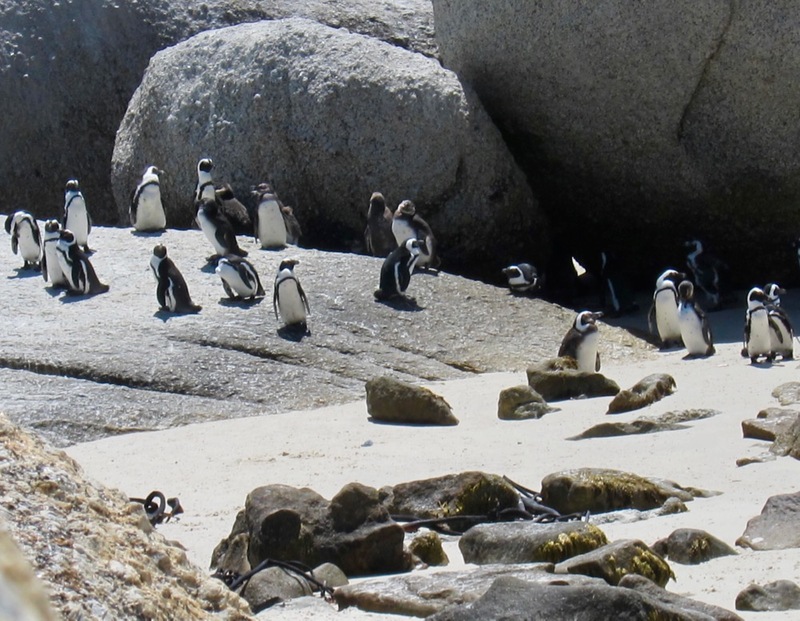 The Penguins have their own beach and they have enjoyed this for years now. What really entertained us was watching the Penguins pottering about on land, clumsy as they are. They are gregarious and tootle about from group to group like playground mothers. They seem to be telling interesting stories to each other and imagining them with human voices nattering away can fill an afternoon. One group was clearly a group of nuns with Mother Superior out in front giving them a serious dressing down. In another group, a maverick big mouth was punished and sent to stand in the corner staring at the great beyond. Then a group meeting took place with much fin/arm/wing waving and small strut gesticulating, the upshot of which he was invited in again. ​The sheepishness of his return indicated the depth of the social error he had committed. Or maybe they were just imitating humans with penguinomorphisms? If we can do it, why not they? You'll find them stretched out sunning themselves, having a walk with a friend or having a community grump festival. These birds are of ancient lineage, said to have evolved around 65 million years ago. 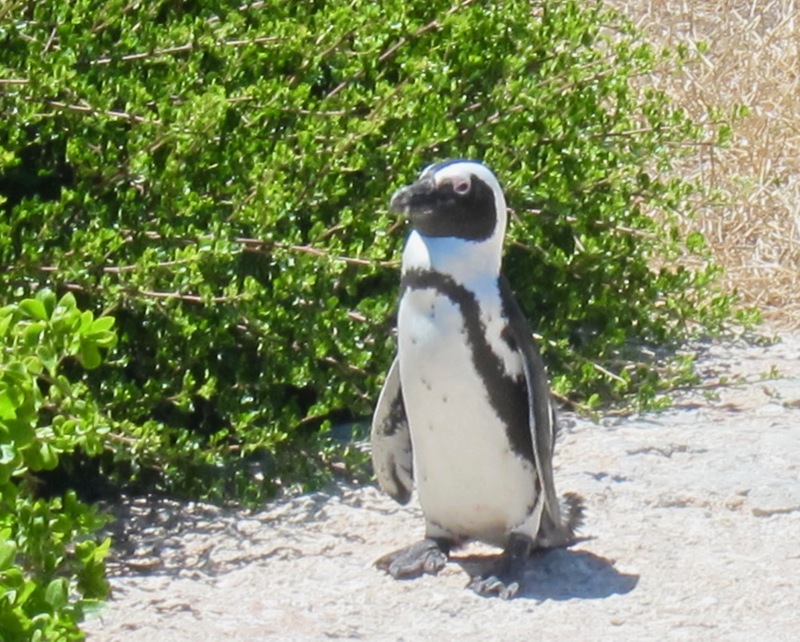 There are at least 17 species of penguins and since this is the only one that lives in Africa, it is now called the African Penguin, a much more appropriate name than its Blackfoot Penguin or Jackass Penguin moniker earned for the appalling racket it can make. 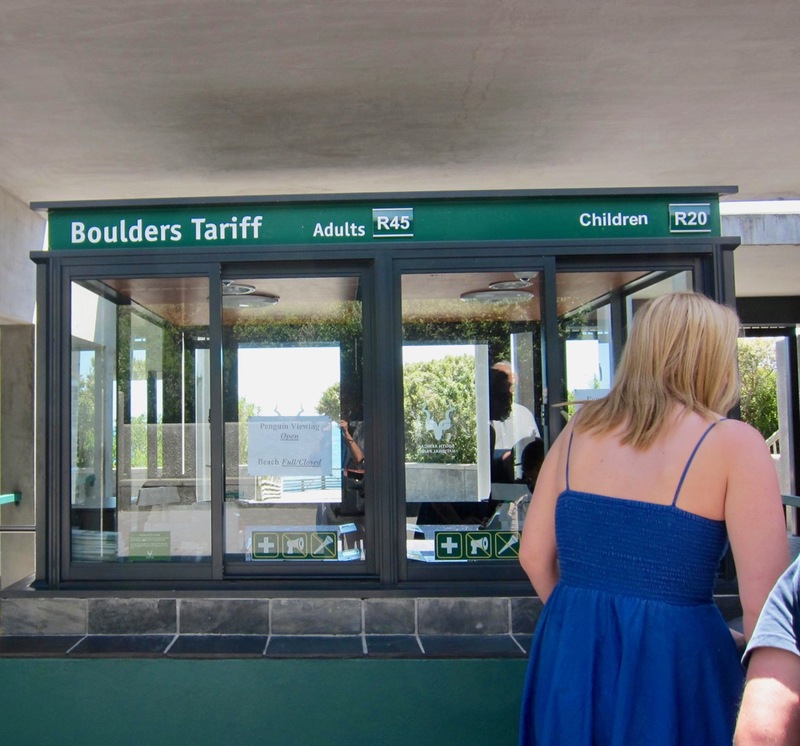 Where about is Boulder's Beach? It is in the picturesque town of Simon's Bay in the Western Cape, an easy drive from Capetown. Where did they come from? Who dreamed of Boulder's Beach in Simons Town? Great legends here! Not only that, they continued to reproduce at 60% each year. The family has grown each year despite dangers to the young when they first put out to sea and the repulsive human food hurled at them. 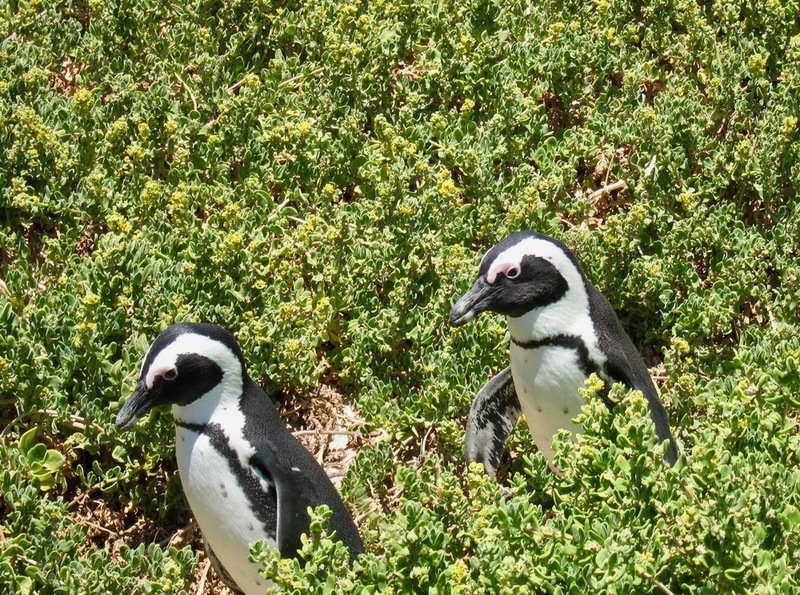 ​The locals say these penguins came around 1983 and just decided to stay on. Penguins are really cold climate animals but they have evolved in Africa and South America. The "tropical" have shorter feathers as they don't need that much insulation. But wherever they are, they are expert swimmers and can swim at 24 kms. per hour. They can dive as deep as 35 meters, more than is regularly allowed for divers and can stay down there for at least a minute and a half. They need this to feed as sometimes, they have to reach down for fish where all the other birds can't. But they are multi-talented pool denizens with Olympic level talent in diving, sprints and Iron Man type distances. Finding the 300 to 700 grams of fish a day, depending on the season, is not optional. They used to nest in thick guano but because this was gathered for fertilizer, they adapted to burrowing and nestling under thick beach vegetation to protect their chicks from the sun. I think they have a celebration each year on the day of their liberation from Guano mining!!! They start to mate at around 4 years and they remain mostly with one partner. Penguins produce only one or two eggs a year with an incubaton period of 40 days. 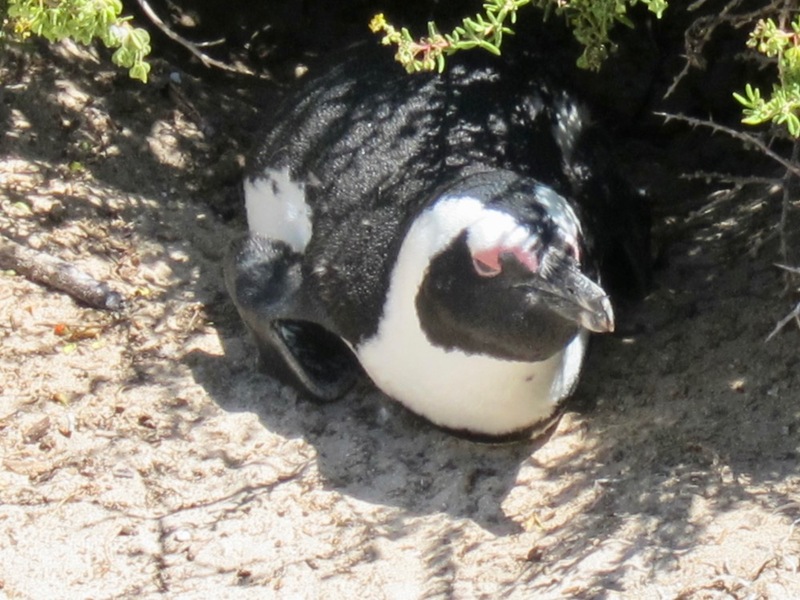 You can see some of their nests in Boulders Beach. They try to return to the same nest each year. 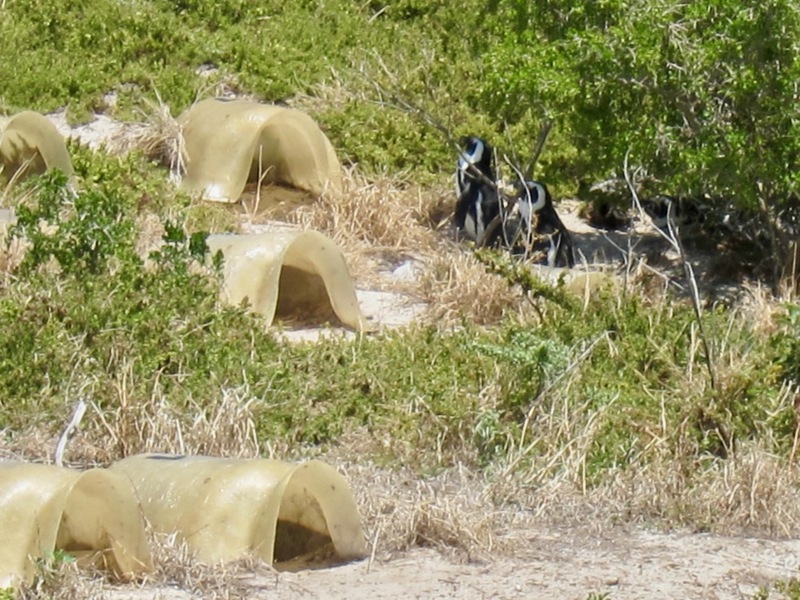 In Boulders Beach, a sanctuary has been developed for them. 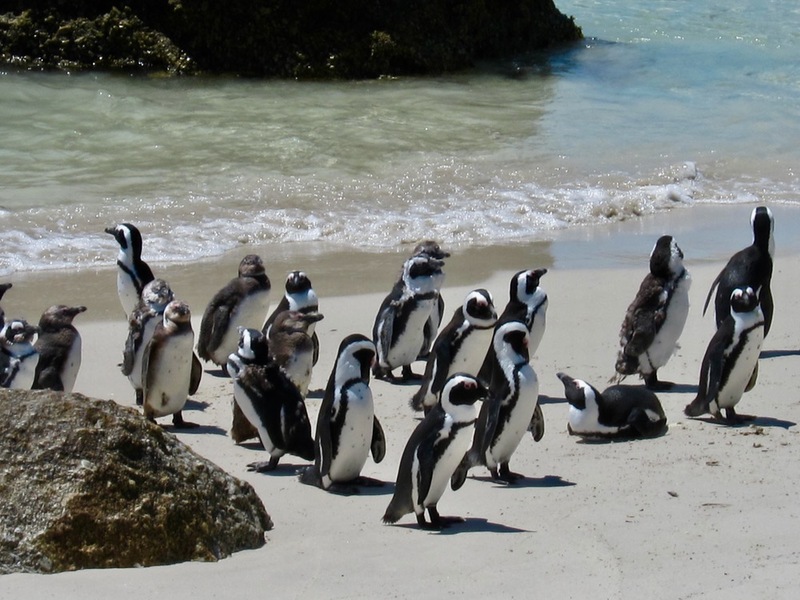 The Southern African National Foundation for the Conservation of Coastal Birds has helped to make life easy for the penguins. 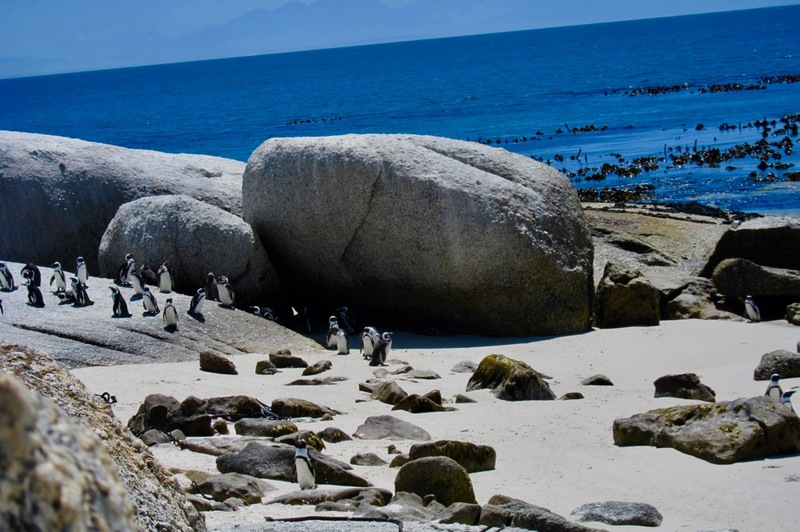 They have an information center right here in Boulders Beach in Simons Town and have designed a protective environment for the penguins. One can adopt a penguin or support a rescue or volunteer. 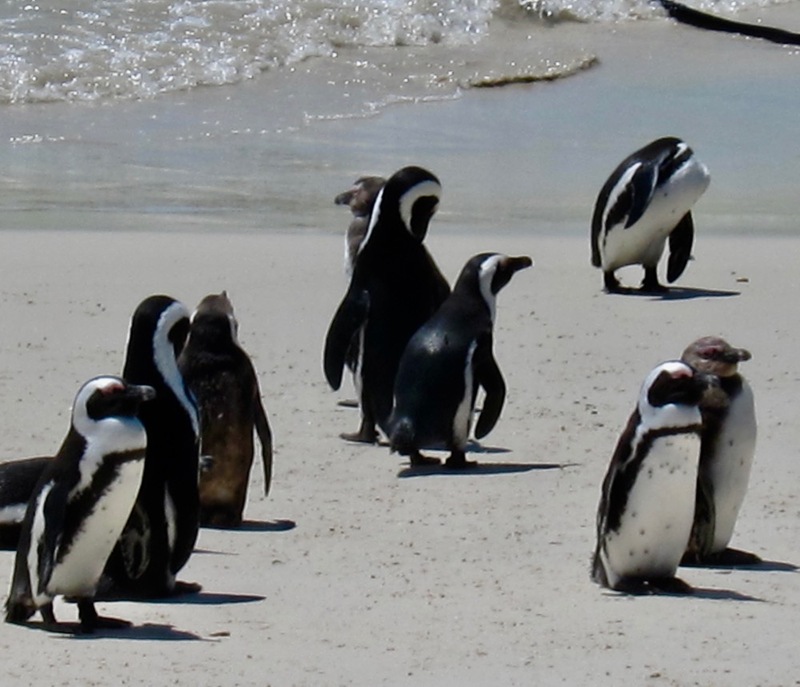 ​Here's a video of the Penguins in Boulder's Beach.